Dr. Nour Tarraf finished his BDS at Cairo University with Honors in 2001 followed by an orthodontic residency at Cairo University. He then moved to Sydney where he completed his Masters degree in Orthodontics at the University of Sydney in 2008 with Honors. 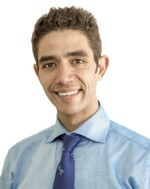 He works in private practice in Chatswood and is involved in research and teaching at the University of Sydney. Nour is a member of Royal Australasian College of Dental Surgeons, the Royal College of Surgeons of Edinburgh, the Royal Society of Medicine, the Australian Society of Lingual Orthodontics and the European Society of Orthodontists. Nour has a special interest in invisible orthodontic techniques such as lingual orthodontics and Invisalign. He also has a keen interest in the clinical applications of temporary anchorage devices (TADs) and is currently working towards a PhD on the application of skeletal anchorage in growth modification for growing children. The Adult Orthodontic Patient: More Options than Ever Before!